Digital Transformation is a type of Business Transformation that is driven by emerging technologies. The potential for top line growth and bottom line savings of a Digital Transformation Program exceeds that of other types of Transformation initiatives. Organizations across all industries are undertaking "Digital Transformation"projects. But, what exactly is it? And, are they doing it right? There are numerous emerging technology trends that drive Digital Transformation. Notable ones include Social Media, Mobility, Internet of Things (IoT), Cybersecurity, Big Data & Analytics, Cloud Computing, Robotic Process Automation (RPA), Artificial Intelligence (namely Machine Learning), Blockchain, and so forth. The applicability of technology is largely dependent on the industry and organization. With these technology trends, businesses are armed with the capability to fully digitize, transform, and grow their organizations. These technologies, in fact, mobilize 8 levers to Digital Transformation—spanning both Growth (business drivers) and Operational Improvement (business enablers). 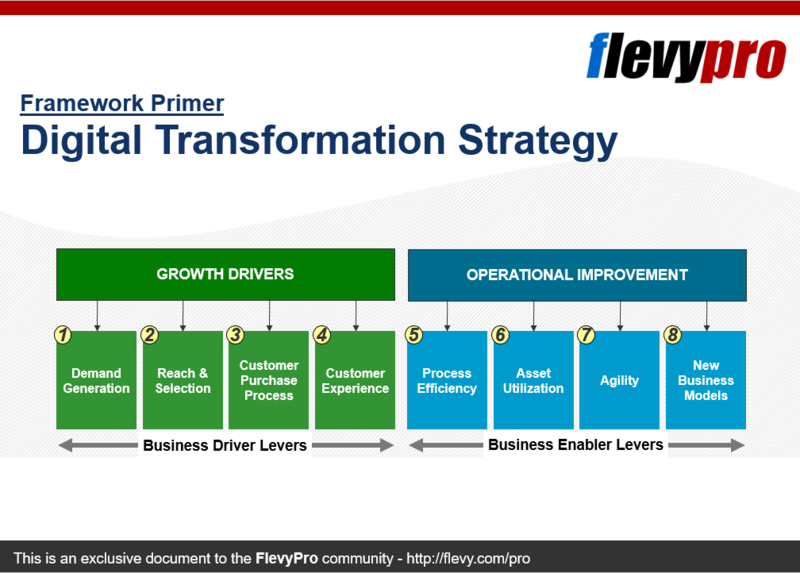 These 8 levers are listed and depicted below; and are at the core of Flevy's approach to Digital Transformation Strategy. Let's take a deeper look into the 4 levers that drive growth for the organization. Emerging technologies, particularly Social Media (and Social Media Marketing), are facilitating Demand Generation by building awareness and brand interest. With an increasing number of customer touch points and ability to collect and unify customer data across these various touch points, we are better able to understand our customers and their interests—leading towards customer "micro-segmentation." Likewise, advertising platforms (as they, too, are collecting more and more customer data) also allow for more targeted ads. You can reach consumers by demographics, behavior, location, interests, and so forth. Thus, Customer Experience has grown in increasing importance. Immediate growth opportunities tends to come through Customer Experiences and relationships that adapt to their dynamics and demands. In fact, of the growth drivers, Customer Experience (CX) is the most impactful and at the core of Digital Transformation-driven growth. Refer to these best practice frameworks on CX for more on the topic. Typically, Customer Experience Strategy is a focal point within any Digital Transformation Program. Customer Experience has evolved from a traditional linear process (with few touch points) to a continuous, circular process (with constant touch points). This change in Customer Experience is so significant that many top management consulting firms have developed their own frameworks addressing this behavioral and operational change, such as McKinsey's Customer Decision Journey and Accenture's Nonstop Customer Experience Model. Our complimentary primer to Digital Transformation Strategy provides an overview to the 8 levers to Digital Transformation. This presentation also touches on 6 technology trends driving Digital Transformation. Today's Customer Journey and Purchase Process is dynamic, accessible, and continuous, because the digital touch points consumers are exposed to are always on and customers can constantly re-evaluate their purchase options. Enabled by technology, customers expect to easily control and vary their routes within and across channels to suit their needs at any given moment. Customers now expect their experiences to be continuous, constant, customized, and cross-channel. The key, then, is for us to deliver a continuous Customer Experience via an integrated Omnichannel Strategy. Otherwise, in today’s "switching economy," a customer may quickly look for a different provider that does provide the continuous experience she desires. For a more in-depth discussion on the 4 growth drivers to Digital Transformation, as well as the 4 levers to operational improvement, take a look at our Digital Transformation Strategy methodology document. In addition to discussing the levers to Digital Transformation Strategy, this document also provides a framework for Digital Transformation Execution. We lays out key phases and functional layers. Furthermore, we provide a framework for Digital Maturity—i.e. know where you stand and how to gradually improve/mature across the areas of Customer Experience, Operations, and Information/Technology. Studies have shown organizations that have excelled in Digital Transformation (i.e. "Digital Leaders") distinguish themselves through their mastery of the 4 critical business ecosystems. More information on the Digital Transformation: Integrated Business Ecosystems methodology can be found here. The 3 documents below highlight the core concepts of Digital Transformation discussed in this article. In building your organization's Digital Transformation Strategy and Program, we recommend consulting these best practice reference guides. Digital Transformation is being embraced by companies across most industries, as the role of technology shifts from being a business enabler to a business driver. Beyond the topics mentioned above, additional concepts covered include Customer Experience Matrix, McKinsey's Customer Decision Journey, Accenture's Nonstop Customer Experience Model, Digital Maturity Assessment, Digital Maturity Model, 6 Layers of Successful Execution, Digital Operating Models, Customer Interaction Channel Map, among others. This is a partial preview of the full document. These Business Ecosystems are discussed in context to a 4-level Digital Maturity Model. By the way, only 10% of organizations mature to the highest level. This framework teaches you what is needed to reach that level of Digital Excellence through a 6-phase approach that ties implementation to the 4 ecosystems. Beyond the topics mentioned above, additional topics covered include Business Model Platforms, Supply & Demand Planning, Supply Chain Integration, Artificial Intelligence, Analog vs. Digital Culture, among others. It is critical that all businesses create a CX Strategy, an all encompassing view of how they will deliver superb experiences to their customers. Having such a strategy will increase customer satisfaction and loyalty, grow word of mouth referrals and significantly contribute to your bottom line. This framework introduces an easy to use 1-page template for capturing a CX strategy and provides a comprehensive guide to completing the template. Looking for something more specific on Digital Transformation? Take a look at our selection of best practice methodologies below.